LONDON--(BUSINESS WIRE)--Market research firm Technavio has announced the release of their latest report on the enterprise indoor location-based services market in the US. This new report will provide expert market insights for the forecast period 2018-2022. The report will follow up on Technavio’s previous enterprise indoor location-based services market in the US research, offering detailed market intelligence based on an analysis of the recent trends, market drivers, and challenges, to arrive at actionable insights during the forecast period. 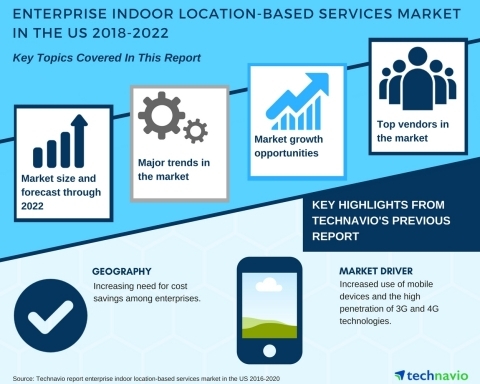 The updated research report on the enterprise indoor location-based services market in the US is an integral part of Technavio’s machine to machine (M2M) and connected devices portfolio. Technavio covers an extensive range of market research reports on the machine to machine and connected devices market, encompassing different regions and top industry segments. Some of the topics include pet wearable, maritime information, mobile mapping, and intelligent transport system. Technavio’s previous report on the enterprise indoor location-based services market in the US projected that the demand for indoor LBS is being promoted by the increasing need for cost savings among enterprises. Factors such as the increased adoption of LBS in shopping complexes, financial institutions, government buildings, hospitals, and warehouses will result in the strong growth of this market. Technavio’s new report on the enterprise indoor location-based services market in the US will evaluate the key geographical regions and their behavior over the past four years, introducing new data and observations and providing new predictions. Technavio’s report on the enterprise indoor location-based services market in the US for the period 2018-2022 is available to order now and will be delivered within one week of purchase. Market research firm Technavio has announced the release of their latest report on the enterprise indoor location-based services market in the US.